The nuclear-powered aircraft carrier USS Gerald R. Ford (CVN-78), the lead of vessel of the U.S. Navy’s latest class of carriers, and the most expensive warship in U.S. history, began a post-shakedown availability (PSA) period at Newport News Shipbuilding in Newport News, Virginia on July 14, the service said in a statement. A post-shakedown availability period is used to address technical deficiencies found after the successful completion of sea trials. It is also during this phase that the final integration of the USS Gerald R. Ford combat systems will take place. “The shakedown period was an opportunity for the Navy to run the ship through a rigorous set of operational tasks and assess her performance,” the commanding officer of the Ford, Captain Richard McCormack said. 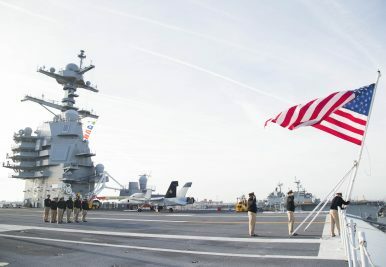 “We now enter a post-shakedown availability period to incorporate several design changes to correct performance deficiencies and complete the installation of other systems needed to ensure the ship, her embarked air-wing and the strike group are ready to support national tasking when called upon by the President,” McCormack added. Several needed design changes are responsible that the first-of-class carrier breached a $12.9 billion spending lid set by Congress by $120 million in May. Among other things, the extra money is used to fix the supercarrier’s faulty advanced weapons elevators used to transport ammunition from the lower to the upper decks, as well as to repair the the Ford’s propulsion system bearing, which was damaged during sea trials in January. Total acquisition costs now stand at $13.027 billion with total cost overruns amounting to about $ 2.4 billions for the new carrier. “CVN 78 began construction with immature technologies and an incomplete design, leading to cost and schedule growth,” the U.S. Government Accountability Office noted in an April report. “The ship delivered 20 months later than the Navy planned, with construction-related work still remaining and over 40 serious deficiencies that could impact ship operation or safety.” The various deficiencies are now being addressed during the PSA phase. Untried new technologies, next to the advanced weapons elevators include the carrier’s four main turbine generators, a new dual-band radar system, a new advanced arresting gear on the flight deck, as well as the new electromagnetic aircraft launch system. The U.S. Navy’s most expensive warships will be able to carry over 75 aircraft including the F-35C variant of Lockheed Martin’s Lightning II stealth multirole fighter. At a length of 1,106 feet (337 meters) and a flight deck beam of 56 feet (78 meters), the 100,000-ton flattop will have a crew complement of around 4,200. Following completion of the PSA phase, the carrier will undergo shock trials. The Navy initially considered cancelling shock trials, in order to speed up the combat deployment of the Ford by a year from 2022 to 2021. However, the Pentagon objected and endorsed the trials. During shock trials underwater charges are detonated in close proximity to the carrier to test how well the Ford’s key systems would do under combat conditions. The U.S. Navy expects to operate the Ford-class for the next eighty-seven years until 2105.